This district to the west of the city centre has few green spaces, and a lot of traffic. Oud-West is a densely populated urban sprawl, a lower-income and far more hectic area than its neighbours to the north, Jordaan and Westerpark. 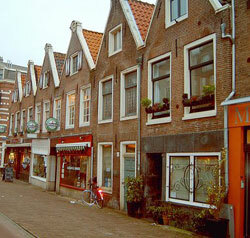 Oud-West includes the Kinkerstraat, one of Amsterdam’s biggest shopping streets. Parallel to it is the Overtoom, a major city road. Crossing both at right angles is Jan Pieter Heijestraat, where there is a diversity of restaurants and shops. On the nearby Ten Katestraat is the Ten Katemarkt, with over 100 stalls. Oud-West is a great place to wander around in during the day.